Today's objective is to make AuNP fibers using lysozyme and BSA. All of the fibers that I made yesterday formed AuNP. Today, we decided to decrease the amount of lysozyme in our samples in order to encourage better fiber formation. 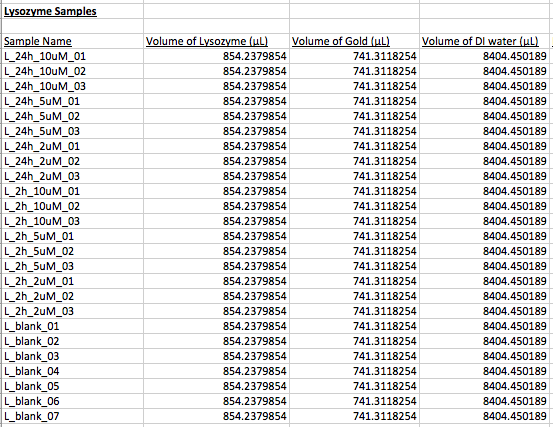 We changed the ratio of lysozyme:gold from 1:45 to 1:60. We also decided to try making fibers using BSA because BSA might also encourage better fiber formation. 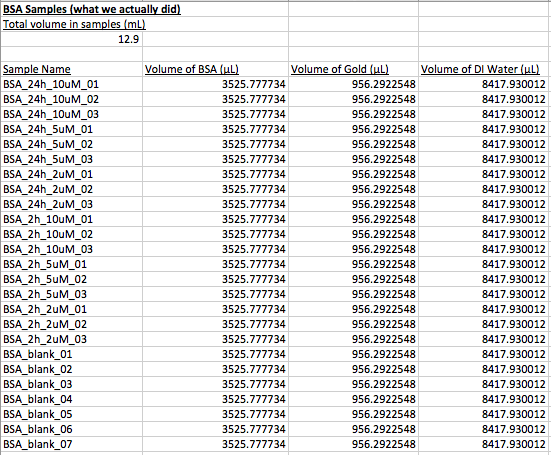 The ratio of BSA:gold that we used was 1:120. Additionally, we decided to make a batch of 9 lysozyme and 9 BSA samples to incubate in Rhodamine for 2 hours. We also decided to make a batch of 9 lysozyme and 9 BSA samples to incubate in Rhodamine for 24 hours. We made a batch of 7 lysozyme and 7 BSA samples ("blanks") that we will use to make a standard curve for the concentration of Rhodamine as a function of its UV-Vis absorbance. We then incubated the samples at 80 degrees Celsius for 4 hours. Tomorrow, we will incubate samples for 2 and 24 hours. NOTE: We will have to adjust the volume of Rhodamine so that the final concentrations are 10, 5, and 2µM of Rhodamine in the samples for the BSA samples. I factored this in to our spreadsheet. We will also make both standard curves and then measure the absorbance of the 2 hour samples. We will measure the 24 hour samples on Thursday. This page was last edited on 27 September 2017, at 01:43.